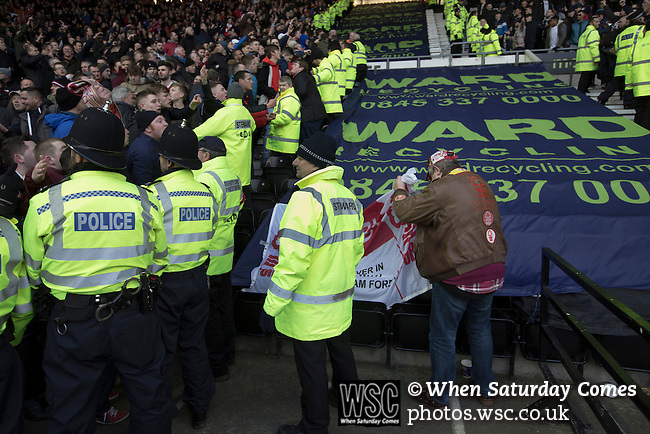 Derby County 1 Nottingham Forest 2, 17/01/2015. iPro Stadium, Championship. An away supporters retrieves a flag a visiting supporters celebrate at the conclusion of Derby Country's Championship match against Nottingham Forest at the iPro Stadium, Derby. The match was won by the visitors by 2 goals to 1, watched by a derby-day crowd of 32,705. The stadium, opened in 1997, was formerly known as Pride Park. Photo by Colin McPherson.